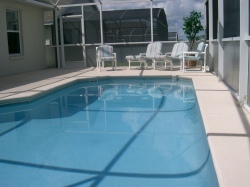 A four bedroom, 3 bathroom pool home at the Florida Pines subdivision. Available for vacation rental this beautiful home has it's own private heated swimming pool. Florida Pines is located on US27 close to the intersection with H192 which is home to many shops, supermarkets, petrol stations and a variety of restaurants. Disney World can be reached in about 10 minutes and there is a newly built Publix supermarket about 5 minutes drive from your villa. Orlando International airport is about 35 minutes drive away, and Tampa airport about 75 minutes. The superb Gulf coast beaches can be reached in about 90 minutes while to the east, Kennedy Space Centre and Cocoa beach on the Atlantic coast can be reached in about an hour. The single storey accommodation comprises four bedrooms and three bathrooms along with a fully fitted kitchen, breakfast bar and dining area. 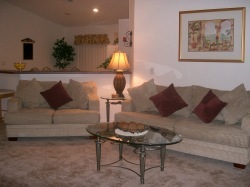 This vacation home is well equipped and furnished to a high standard. As you would expect the villa is tastefully decorated and fully air-conditioned. It has a spacious lounge area, which has an Entertainment center with cable TV, DVD player, Hi-fi and Playstation2 (with games provided). Boardgames, books and magazines are also available. Patio Doors lead to the Pool area. The villa features two master bedrooms. Each has cable TV, DVD player and Radio alarm clock and are served by their own private, luxury en-suite bathroom, with shower, wash basin and WC. 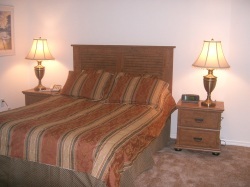 Both Twin Bedrooms have 2 twin beds and include cable TV. One has a Playstation2 for the kids. They both share an en-suite bathroom, with shower, wash basin and WC. The Pool and Patio areas are fully screened to allow you to relax and enjoy the pool late into the evening. There is electric heating available (charges apply) as well as underwater pool lighting. There are also water toys for the young at heart (basketball etc). Pool furniture is provided along with a supply of pool towels. The deck area has both sunny and shaded areas for your enjoyment. The patio doors leading to the pool deck are fitted with a safety alarm to ensure children cannot access this area unsupervised. The fully equipped Kitchen is fitted out with everything you would need during your Florida vacation. This includes oven & hob, large fridge freezer, dishwasher and teapot. There is also a dining area and breakfast bar. The price includes all gas, electricity, linens, towels etc. Even those small items that are occasionally required are provided such as vacuum cleaner, iron and ironing board, hairdryer etc. Local calls are free, long distance and international calls can be made via a telephone calling card widely available throughout the area. 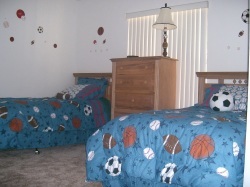 The Florida Pines Community has a play area and a large communal pool.